About 1 in 5 people infected with Zika virus become ill. The most common symptoms of Zika are fever, rash, joint pain, or red eyes. Other symptoms include muscle pain, headache, pain behind the eyes, and vomiting. Deaths due to Zika have not been reported. The first well documented case of Zika virus was in 1964, beginning with a mild headache and progressing to a maculopapular rash, fever, and back pain. Within 2 days, the rash was fading, and within 3 days, the fever was gone and only the rash remained. So, the most common symptoms of Zika virus disease are mild fever, rash, conjunctivitis, headaches and arthralgia, which appears between three and twelve days after the mosquito vector bite. One out of four people may not develop symptoms, but among those who are affected, the disease is usually mild with symptoms that can last between two and seven days. Severe disease requiring hospitalization is uncommon. Complications (neurological, autoimmune) are rare, but have been described in the outbreaks in Polynesia. 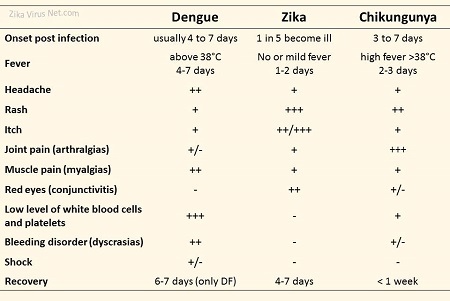 The symptoms of zika fever are similar to other flaviviruses such as Dengue fever or chikungunya (see figure 2), which means that it can be easily mistaken for one of those illnesses. The majority of cases (60-80%) are asymptomatic. The main clinical symptoms in patients are low-grade fever, conjunctivitis, transient arthritis/arthralgia (mainly in the smaller joints of the hands and feet) and maculopapular rash that often starts on the face and then spreads throughout the body. Hemorrhagic manifestations have been documented in only one instance, hematospermia (red–brown fluid in ejaculate). During the outbreak in French Polynesia there was also noted to be a concomitant increase in cases of Guillain-Barré Syndrome which could have been due to Zika but has not been proven. Video 1. Brazil links fast-spreading Zika virus to birth defects. A pregnant woman can pass Zika virus to her fetus during pregnancy. Zika is a cause of microcephaly and other severe fetal brain defects in northeast Brazil (see video 1). Figure 2: Zika fever symptoms of babies born with microcephaly.